The weather is getting warmer and demand for barbecues and beer is rising – no better time to think about making room for more kegs! We all know that cooler space is one of the most expensive storage areas in the warehouse and with increasing SKUs from an exploding craft beer market and fickle demand you’ll need an economical, efficient way to maximize this space… Mallard Keg Flow is the answer. Keg Flow is gravity-fed roller storage designed just for kegs, it’s that simple. Providing dense, multi-level keg storage, keg flow stores up to 8 kegs deep and 8 kegs wide per 96″ bay – accommodating all keg types and sizes. 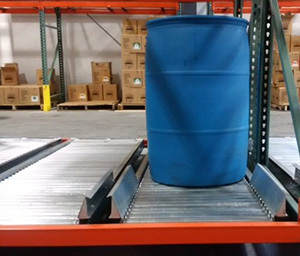 Each lane can store a unique SKU with first-in, first-out (FIFO) inventory rotation or last-in, first-out (LIFO) rotation as needed for push systems. Keg flow optimizes space and provides needed selectivity while reducing travel time for increased productivity. 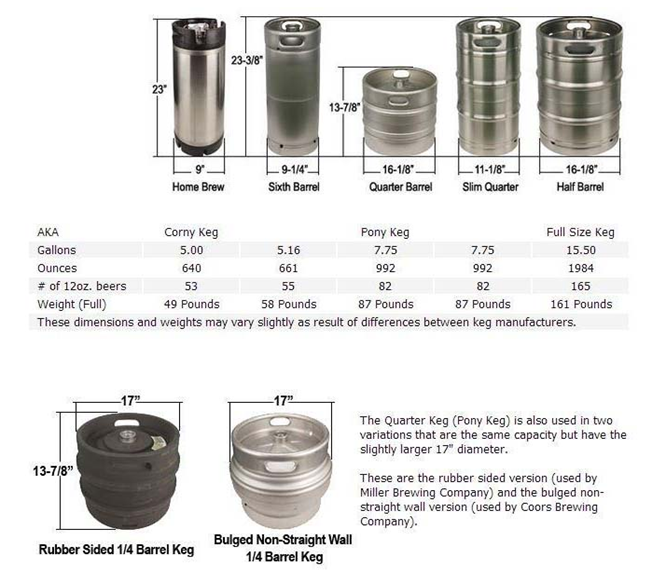 What types & size of kegs do you store – we’ve included a handy chart (below) to help you identify and specify the kegs you are storing. What are the average quantities of each keg size – include your min/max inventory quantity for each SKU and allow for growth in SKUs where expected. Which roller sizes should you use – Mallard recommends durable 1.9” diameter rollers with hex axles vs 1 3/8” rollers. Larger diameter rollers with hex axles provide greater capacity and long term durability. Do you require galvanized finish on the rack? Galvanized pallet rack is often recommended for storing products in exposed environments – outdoors, freezer and cooler rooms for example. What is the required depth per lane? – using the data gathered in #1 & #2 the lane depth can be determined (#of kegs per lane). What type of racking will the keg flow be attached to – this is an important distinction but not to worry because Mallard offers several different attachment brackets for both roll-formed and structural rack to ensure the most secure fit. How many levels of keg flow would best suit your needs – if your system will be hand picked and loaded the height of the lanes will be an important determinant for efficient, ergonomic order selection – if levels are too high or too low it could result in a lag in productivity or worker injury. How will you handle replenishment storage for your keg flow system – depending on space availability and inventory mix you can choose from several options for reserve storage and selection. For example using selective pallet rack is an option for kegs stored on pallets providing optimal SKU selectivity. The chart below can be used to help specify your system requirements. Keg flow works with all sizes and shaped kegs. Our goal is for you to meet your pick-rate and fulfillment goals so that you can sit back at a barbecue, crack open some trendy craft brew and actually enjoy it! We’ve got this, call us today and together we can make it happen.